Powers/Abilities: The Death's Head Squadron possessed a number of psychic powers, including the ability to fly, to sense the thoughts and emotions of others, to cast psychic illusions, and could emit a powerful sonic blast and fire energy from their hands. History: (Nick Fury, Agent of S.H.I.E.L.D. II#6 (fb)) - The Death's Head Squadron were members of the Gnobian race, born of the Gnobian mother, and consumed by the madness of Baron Wolfgang von Strucker, who had merged with the mother in 1944. When the Gnobians were awakened by Wilhelm Schmidt and Werner von Strucker in recent years, they adopted the guise of the Death's Head Squadron, based upon Strucker's Death's Head Guard who had accompanied him in 1944. Their first act was to take Werner's wife and destroy her mind. They informed Werner and Schmidt that they would only restore her if they continued to assist them. (Nick Fury, Agent of S.H.I.E.L.D. II#3 (fb) - BTS) - The Death's Head Squadron made allies with organizations who held similiar beliefs, including HYDRA and Neo-Nazis. (Nick Fury, Agent of S.H.I.E.L.D. II#1) - The Death's Head Squadron killed a pair of C.I.A. operatives in Hamburg, Germany, bringing the total number of dead C.I.A. agents up to ten. They sent the C.I.A. a video-taped message, informing them to tell "the old Howler" that the Death's Head "does not forget or forgive." Later, two of the Death's Head attacked Timothy "Dum-Dum" Dugan, a retired S.H.I.E.L.D. agent and one-time Howling Commando, and killed him and his wife, then brought Dugan's body to Nick Fury's home in Nova Scotia, telling him that Dugan was the first in their blood debt. (Nick Fury, Agent of S.H.I.E.L.D. II#2) - The Death's Head Squadron brought Schmidt to the Gnobian mother so that he could merge with her. They then set after Lump, the young Gnobian raised by Schmidt, but he could sense the evil in them and ran. He was distracted when the now-possessed Schmidt reappeared, and the Squadron blasted Lump unconscious. While they studied him, they found that Lump had been in psychic contact with Red, a Deltan-model LMD, and the mother, speaking through Schmidt, ordered them to collect her. They invaded the nightclub of Network Nina in the Florida Keys, battling Nick Fury, Kate Neville, Al MacKenzie, Valentina De Fontaine and Alexander Goodwin Pierce. Two of the Squad captured Red, taking Neville with them, while Fury killed one of the Squad, then unmasked him, surprised to find an extraterrestrial beneath the mask. (Nick Fury, Agent of S.H.I.E.L.D. II#3) - When Schmidt regained control over his actions, a member of the Squad helped bring him back under the mother's influence. The Squadron watched as Red and Neville were placed in a memory chamber at the Gnobian base, and events leading to the destruction of the S.H.I.E.L.D. Satellite were replayed. 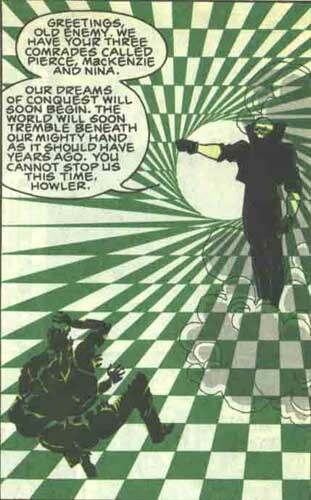 Werner von Strucker helped capture Al MacKenzie, Network Nina and Alexander Goodwin Pierce when they came too close to their base, and a Squadron member went to inform Fury, telling him to come where Gruenstadt once stood. They then placed Nina, MacKenzie and Pierce into the memory chamber. When Fury came to the base, accompanied by De Fontaine, the Squadron did not recognize him, so the mother altered his appearance so that he looked as he did in 1944. (Nick Fury, Agent of S.H.I.E.L.D. II#4) - The Death's Head Squadron assaulted a NATO base at Fort Washington, killing hundreds of soldiers, then informing a survivor to tell his people that "their day is done. The dawn of the Death's Head is breaking." The squadron members back at the base continued to monitor their captives within the memory chamber, while planning to unleash a Kree Death Missile to slaughter millions. (Nick Fury, Agent of S.H.I.E.L.D. II#5) - Speaking through Schmidt, the mother commanded the Death's Head Squadron to set out and fulfill Strucker's dreams, leaving a handful to monitor the captives in the memory chamber. (Nick Fury, Agent of S.H.I.E.L.D. II#6) - Hundreds of the Death's Head Squadron journeyed to rendezvous with their Neo-Nazi allies in Germany, only to turn on them and kill them, considering them too weak to live in their vision of Strucker's world. As they continued in their assault upon Germany, the mother's mind was linked to that of Lump's by Network Nina, thereby linking to all of the Death's Head. Having regained her sanity, the Gnobian mother destroyed herself to prevent her losing control again, and all of the Death's Head burst into flames and perished simultaneously. Comments: Created by Bob Harras, Bob Hall and Kim DeMulder. Fury I#1 seems to claim that the Gnobians were all created by Arnim Zola as a hoax, but it doesn't jive with the actual story-- it doesn't explain where the Sentry or Kree Death Missile came from, why Strucker killed everyone in Gruenstadt, or where Lump came from. I think it's best to ignore the retcon.